Richie Sadlier and Kevin Doyle were positive about Ireland's Euro 2020 qualification hopes following Sunday’s draw in Dublin. Ireland were drawn with Switzerland, Denmark, Georgia and Gibraltar in Group D.
Speaking on RTE’s coverage, Sadlier said: "It could have been a lot worse. We spoke about the merits of being in a group with five teams as opposed to six. What it means is that we’re going to have two competitive fixtures in March but on two other dates reserved for fixtures ,we won't have a game. 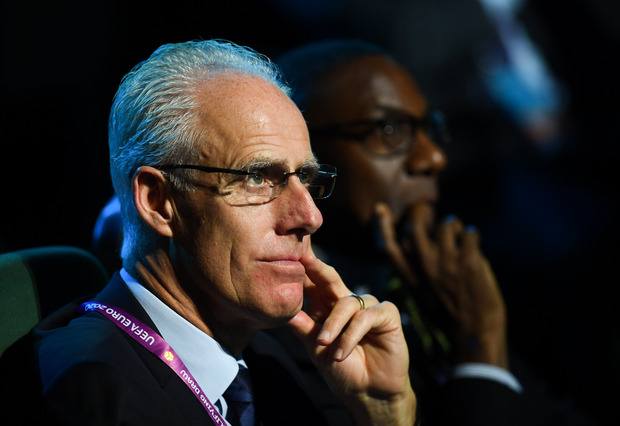 "So that’s an opportunity for Mick McCarthy. Does he have a training camp then, does he have a couple of friendlies? That’s a little bit of leeway and a little bit of room. That’s important because we’re talking about a manager who has yet to meet the players, let alone take a training session or have a game to get his ideas across. As it is, he won’t have that before the opening fixture." Ireland were drawn in a group with a familiar look to it, having played Denmark, Georgia and Gibraltar over the last two campaigns and the Danes again in the recent Nations League. But Sadlier believes the change in manager means that a different outcome is possible this time around. "Denmark, we know all about them but you would hope that there might be something different about us under a new manager so there might be hopefully something new," he said. "Georgia, we’ve played them recently and had good results but I do remember one game where they really played us off the park. "The Nations League has been good for Gibraltar, they picked up their first competitive points in their history beating Armenia 1-0 away and Lichtenstein 2-1 at home. But anything other than six points against them and you don't warrant discussion in terms of qualification." Doyle was happy to see Switzerland come out as top seeds despite their recent passage to next summer’s Nations League finals. "Georgia are the lowest ranked team in Pot 4. Gibraltar we played before and should be beating them home and away. "Denmark, we drew with them twice in the Nations League when we weren’t playing well. Everyone was saying it was a disaster but we played them twice and drew twice so we might fancy our chances against them with a new manager and a revitalised team. I’m delighted, we have a very good chance of coming out of that group." Ireland had a lucky escape when they were originally drawn into the Group of Death with Holland and Germany only to be moved due to the rule that no more than two host nations can be in the same qualifying group. The change meant heartache for Northern Ireland, who were next out of the pot and were placed in that group. "We avoided Group C which for a second we all thought we were in and that’s the nightmare group," Doyle said. "That’s the stand-out advantage of being a host city," Sadlier added. "We knew if we came out we couldn't go into that group. Thankfully we avoided that but I wouldn't swap places with Northern Ireland for the world. It’s a huge huge advantage for us by missing those two. "Certainly we didn’t want to be in a group with Holland and Germany. It’s a difficult difficult draw for the North."